This thought came to my head as I couldn’t sleep last night. My Tiny Highlight (MyTH) will be weekly and will showcase interesting or useful bacteria. For the first installment, I will focus on the gold standard of biology; Escherichia coli or E. coli. E. coli was discovered in 1885 by a German doctor in feces of healthy people. He called it Bacterium coli commune because it was found in the colon. The classification system of bacteria was much different before the ability to sequence DNA as novel bacteria were initially classified and named by their shape and motility. The name later changed to Bacillus coli before finally being reclassified and named Escherichia coli after the original discoverer. How would you like it if someone named a bacteria from feces after you? E. coli receives a bad reputation thanks to pathogenic strains that force recalls of all kinds of food products. However, those strains are very uncommon as E. coli is one of the most abundant species found in the GI tract of mammals. 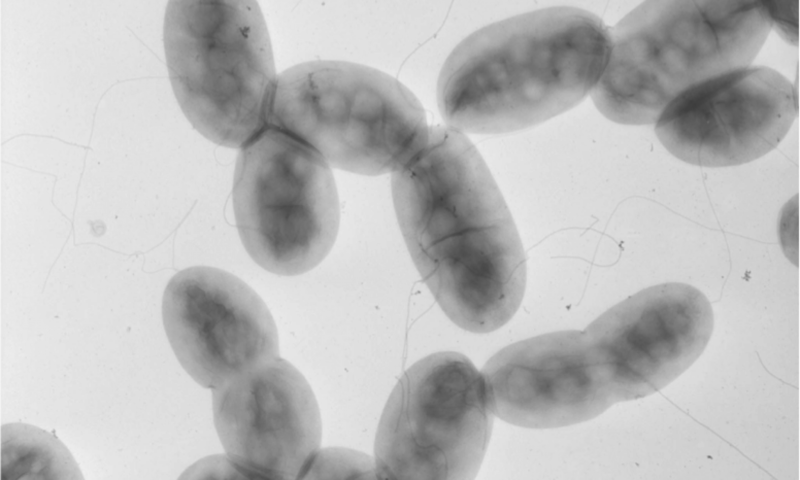 Also, without this bacterium, many of the scientific discoveries of the past 50 years would not be possible including solving protein 3D structures, mass production of insulin, and understanding signal transduction; the process of a cell sensing surrounding signals or cues and responding to them in a way that is favorable for the cell. One reason E. coli was such a well suited model organism is the doubling time or time to divide one cell into two daughter cells. A doubling time of only 20 minutes means in less than 48 hours, the mass of E. coli cells would roughly be equal the the mass of Earth and have the combined volume equalling a 1 meter thick layer of bacteria covering the entire surface of Earth (including oceans). This is incredible and gives E. coli a major advantage over slower growing bacteria. I want to discuss, briefly, a major influence of mine. Julius Adler was born in Germany and became a lover of Nature as a child. He was fascinated with butterflies. His lifelong passion has been behavior of living things. Luckily, he spent most of his professional career studying chemotaxis in E. coli although he now studies fruit flies. Adler is known as the father of chemotaxis, or the movement of a cell in response to sensing chemical signals. His landmark early papers in the journal Nature about chemotaxis in E. coli in 1966 and his later paper on the chemoreceptors, the proteins that interact with the surrounding chemicals, in E. coli laid the foundation that maid the chemotaxis system of E. coli the best characterized signaling pathway in Biology. In regards to chemotaxis, however, E. coli is on the simplistic side of the scale. For example, E. coli has 5 chemoreceptors and 1 chemotaxis operon, or a stretch of genes that are transcribed into RNA together but lead to distinctly different proteins that usually interact with each other. Through the explosion of genome sequencing, scientists can scan newly sequenced bacteria genomes for chemotaxis genes. The average number of chemoreceptor genes is roughly 5 times more than E. coli (~25) and it is more common for bacteria to harbor multiple chemotaxis operons suggesting most bacteria have evolved to use chemotaxis for regulate more than the motility behavior in these cells. Let’s think a minute about why E. coli is ‘stupid’ compared to other bacteria. By ‘stupid’ I mean, they have less capacity to integrate signals from their surroundings into a cell response. Why doesn’t E. coli have 25 chemoreceptors, for example? For the answer, we just need look at where this microbe is found. The GI tract of mammals is fairly constant meaning there is less need to scavenge for a new home or adjust to changes in temperature or nutrients. We as mammals have no problems eating meaning E. coli has no problem eating as well. How about the other sequenced bacteria? They predominantly live in more variable environments like soil or oceans where is would be to their advantage to be able to sense a lot of chemicals or nutrients in their surroundings. Therefore, through evolution, they have acquired new abilities to sense through duplicating genes and mutating DNA favorably. Changing only a few nucleotide bases (A,C,G,T) could mean acquiring the ability to physically interact with different environmental chemicals that could serve as an energy source. Nature is awesome and she knows how to keep us, as observers, guessing. You may feel I am biased about chemotaxis ( I am). This was my dissertation work in another bacterium. Check back next week when I will highlight a little known (publicly) soil bacterium, Azospirillum brasilense. If you have any comments, questions, or suggestions PLEASE LET ME KNOW! Recommended reading about Julius Adler. The Human Genome Project: Thank you, Department of Energy! Some of you may not know (or care) about the origination of the Human Genome Project. I just left a meeting discussing the archiving of HGP documents within our group in DOE (Biological and Environmental Research Information System group, formerly the Human Genome Management Information System) with members of DOE’s Office of Scientific & Technical Information (OSTI). It was interesting, being a history buff, the inner workings as described by my fearless leader who was there from the beginning in the mid 1980s, yes the ’80s. Not many people know that the NIH was very hesitant to fund some of the approaches used in the project. However, DOE saw a great opportunity and took a chance. After these projects were successful, NIH was glad to throw tons of money into projects. Even Jim Watson (of Watson and Crick fame) was very hesitant at first. If DOE had not had the vision to proceed in unfamiliar directions, perhaps the Human Genome Project would not have turned out as it did. Some of the technologies that came from the Project now enable for cheaper and better analysis of genomes. 2013 marks the 10 year anniversary of the completion of the HGP. I am glad the documents stemming from meetings in the initial planning of the HGP will be preserved. When the HGP was completed, it was a huge accomplishment for mankind. Without it, progress in human genetics would not be possible (see ENCODE). I personally want to thank the vision within DOE. A presidential adviser, radicalized by American inaction on climate change | MinnPost. New #Science Resources added to site! A few new sites have been added to the Resources page of my blog. I think these will be a great addition. NOAA, USGS: Climate change impacts to U.S. coasts threaten public health, safety and economy.